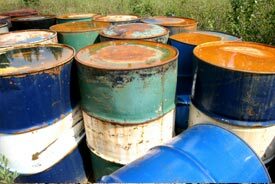 The effective, safe, and compliant management of drums, storage containers, and wastes (hazardous, universal, special waste, C&D, etc.) is essential for managers that desire minimal interference to their operations. This requires reviewing laboratory analytical data, evaluating material safety data sheets, defining material composition, specifying storage requirements, and detailing appropriate disposal methods. A consolidated plan for the safe and environmentally-responsible management of drums, storage containers, and wastes are the result of these actions so that businesses can begin to manage these actions in-house in an appropriate fashion. Environmental Support Network, Inc. offers complete drum and waste management services from identification to storage to ultimate disposal in a means that is both cost-efficient and regulatory compliant.